I have honestly never clicked with this game until recently. I was always dissapointed in it, what essentially was right after the masterpiese of Batsugun. Donpachi is slow, plodding, and chaining more than 40+ is really, really hard, so don't get your hopes up of stage long chains like in DDP, DOJ and DFK. But it's not all about chaining - it's about memorization and skill and for some reason, after Andi mentioned he passed the first loop, I was intrigued to try myself and I have been switching off from this to DFK - the first and last in the series of five DP games. I still maintain it's not one of the greatest of Cave's efforts, but it does have its bright points. Being able to make it just halfway through stage 4 feels like quite an acomplishment and the powered-up type-3 ship is a lot of fun to play with. It does have a lot of tough, enemy-coming-up-from-behind moments where you will end up using bombs - luckily for the player, there are plenty of them in the game. The announcer is terrible, but in a good, laughable kind of way. The OST is awful, but the sound effects are excellent, especially when you are tearing through popcorn enemies. It also drops the rank when you bomb, which is pretty awesome. I try and bomb at least twice in each level and it makes the game much more managable. 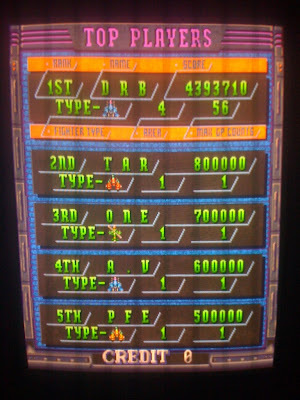 Set this first high score at 4,393,710 at stage 4 when Dave was over Tuesday for some STG goodness. Makes me want to try playing it some more as well... learning that it refills your bombs, and bombing lowering rank really makes me want to give it another chance. You really should - but make sure you play the Japanese version as it is supposed to give you even more bombs than the US version. If you get use to bombing strategically in stages four and five, they aren't killer hard - you just need to practice some and don't be afraid to hit the bomb button. This game just doesn't do it for me. And I don't think it is just any one thing, probably a combo of several things. 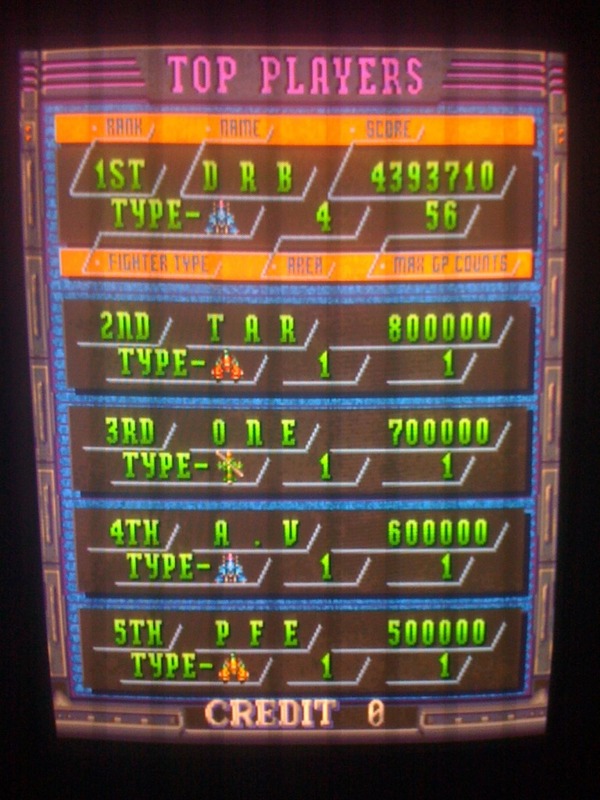 Look at Toaplan's last few shmups. It does not even come close. Ship and background art, mmm, I guess, but that is where the similarities end. I guess I can fire it up in MAME if I want to see if my opinion changes. I think even if you try it again, you probably won't like it any better. Almost certain that te reason I'm playing it is that Andi passed the first loop. It's not like I feel a need to beat Andi specifically, but I like competition. So, I'm kinda manufacturing it to see if I can do it. I think Toaplan made much better Shmups on their way out - Batsugun trumps it without even trying - but it is worth playing. Ahh, okay. I can see that being a motivation for playing games that don't necessarily impress us. For instance, I bought Gears of War for the 360, not because I thought it was a great game (although, it does have its moments) but because my Xbox Live friends showed me where skill and teamwork and certain weapon combinations allowed for some incredible gaming experiences. I soon desired to be able to shoot from the hip with the shotgun, and have patience with the Lancer and the Torque Bow. I see where you are coming from now! I like Donpachi for a few reasons. (1) I already own it and already spent hundreds of credits worth of time on it. (2) The pacing, ship speed, and bullet speed and patterns remind me Batsugun. (3) I love bombing and you get to do plenty of it. (4) The big dumb walls of of semi-aimed spam bullets. Boss 3 is a great example, but it's all over this game. I have turned around on it, that's for sure. I think one of the reasons I keep coming back to it is that it's old-school fun and brutally hard in the later stages. For some reason I like this combo. When Andi (WillyElektrix) was over - he said something about DDP being harder than DP, which I personally don't think is the case - but I think its because the playstyle is so different that if you are good at one, the other will look hard. DP is old school - slow, hard and punishing. DDP is most definitely new school - bullet spam that makes you looks like a god flying through it, fast-paced action, slow-bullets and big explosions. I like both games, but they don't feel like the first and second games in a series when I play them - more like the first and fourth. Keep plugging away at DDP Geoff, and I think you will have a nice surprise at the meet!